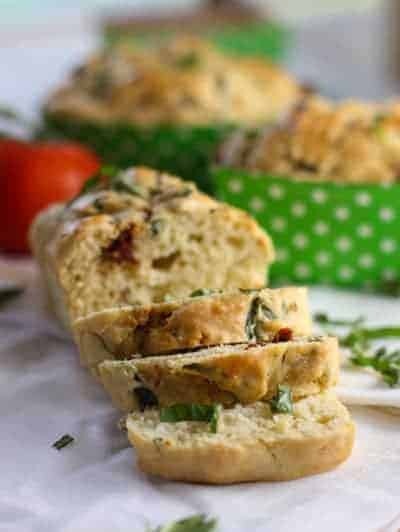 A quick and easy bread full of sun dried tomatoes, chunks of fresh mozzarella and fresh basil! A no yeast quick bread that you can throw together at a moments notice. I have had my eye on this recipe for awhile and after whipping up a batch of San Marzano Soup I thought this would be the perfect fit. And it did not disappoint! It is, without question, the easiest, tastiest bread I’ve run across. I’ll be making this time and time again. This recipe makes one standard loaf but I opted for 3 mini-loaves so I could share with a few pals at work. (and besides, I think the little paper loaf trays are so cute!). NOTES: 1.) I don’t usually take the time to mix dry and wet ingredients separately (I usually make a well in the dry ingredients and mix up all the wet stuff in the center…cheater, cheater, but it works! ), but for this recipe, with the chunky cheese and tomatoes, I would recommend mixing separately 2.) Try to eat this in a day or two. Quick bread usually goes sideways pretty quick. If that happens to you – make croutons out of it! This recipe was adopted from Will Cook for Smiles – A lovely blog I hope you will visit soon! 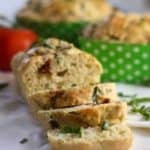 A quick no yeast bread with chunks of sun dried tomatoes and mozzarella . 1 1/4 cups buttermilk or take 2 tablespoons vinegar and add to 2 cup measuring container. Fill milk to 1 1/4 cup. Let sit for a few minutes until think...instant buttermilk! Preheat the oven to 350 and grease an 8x4 inch loaf pan. In a large mixing bowl, combine flour, baking powder, baking soda and salt. Mix well. Add the basil, mozzarella and sun-dried tomatoes to the four and mix until all incorporated. Can this be made w/fresh tomatoes? I don’t think so Kitty. They would be too wet. OK, thx. Just found info on how to roast fresh ones and I will try that, THEN mak that delicious looking recipe!???? I can’t wait to make this bread! Perfect side for a summer salad meal. Awesome idea for a recipe, Kathi! Tomatoes, mozzarella, and basil any any form get my attention. What a great recipe to put these three ingredients in bread! Love it!! This sounds delicious! And I love a “no yeast” bread recipe. The chances of me messing it up are much lower. Haha! I bet this would be amazing toasted and smothered in butter.